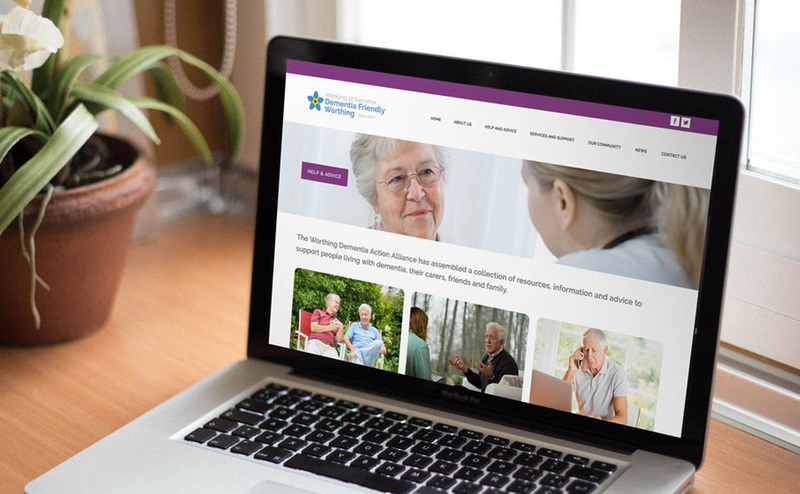 Fine Marketing took on the challenge in September to design and develop a new website for Worthing’s Dementia Action Alliance. We worked with members of the steering group, and in particular carers of people with dementia, to find out how they could best benefit. The most important objective was to make the website a central source of information so that people could be signposted to care services, support, advice, activities, wellbeing and health services, mainly local but some, particularly research, assistive technology and helplines were national. The site was needed as a resource for the community and local businesses, a constant source of information not just for people living with dementia and their carers, but for everyone working and living in the Worthing area. Dementia affects every workplace but remains a hidden issue, therefore, increasing employers and employees’ awareness and understanding, through Dementia Friends information sessions was second, and important objective goal in the website’s development. Gathering all these strands together, designing the site, so it easy navigated, readable and written in a clear and understanding tone, was quite a task to complete with a deadline of fewer than ten weeks from start to finish. The website was launched together with social media channels early in December. As we appreciate the nature of the care sector, have an understanding of dementia and are always keen to make a difference, as well as an impact and we have been overwhelmed with positive feedback. ‘I think it’s a smashing looking website and very easy to use; the links work extremely well. I wish all websites were this easy to navigate and looked so fresh!’ Dawn Fairbrother, Dementia Action Alliance Coordinator and CrISP Facilitator, Alzheimers’ Society. ‘What a brilliant job: the website looks so good! I’m sure many people’s lives will be improved as a result of your hard work so thank you very much.’ Lynda Basford, Carer. ‘It looks really good and is very clear and straight-forward to navigate.’ Bill Demel, Community Development Director, Guild Care. ‘Fantabulous! This is so good and effortless to use.’ Maureen Bacon, Carer. ‘It’s very good. Lovely and straightforward, lots of information and very professional’. Tim Wilkins, Alzheimers Society.